Our monthly series explores the modern relationship between owner and cat — the challenges people face and the incredible benefits of owning a cat in this fast-paced world. This week’s duo is Caroline and Boris. Caroline is a teacher who lives in London with Boris, her ginger feline. 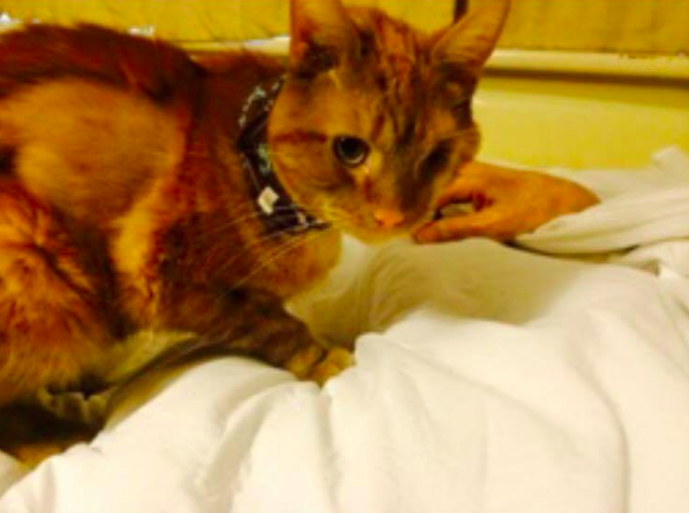 We sat down with Caroline to discuss how Boris came to his name, lost an eye and has been a loved member of the family. How did you find Boris? Boris arrived as a kitten as an early Christmas present for my Dad from my brother. Our previous cat had died a year earlier aged 17, leaving a massive feline void in our lives. He is named after Boris Becker, the tennis player, because of his lovely ginger hair. Most of our previous cats had names beginning with B. What was he like as a kitten? How did you go about training and socialising him? Boris was very affectionate, friendly and cheeky from the outset. Unlike Bugsy, my previous cat, he has never needed to be trained in socialising with people, although he isn’t so keen on other animals. I once had to apologise for his behaviour towards a husky being taken for a walk outside our house. Has Boris had to overcome any obstacles in life? Boris was unfortunately hit by a car when he was 2. He lost an eye, fractured his skull and broke numerous bones. With such a bad head injury, we didn’t know if he would ever be the same cat again. The wonderful vets, however, managed to save him and he returned home. Gradually, as his health improved, his naturally cheeky and lovable personality returned. Boris is now a house cat on vet’s orders. 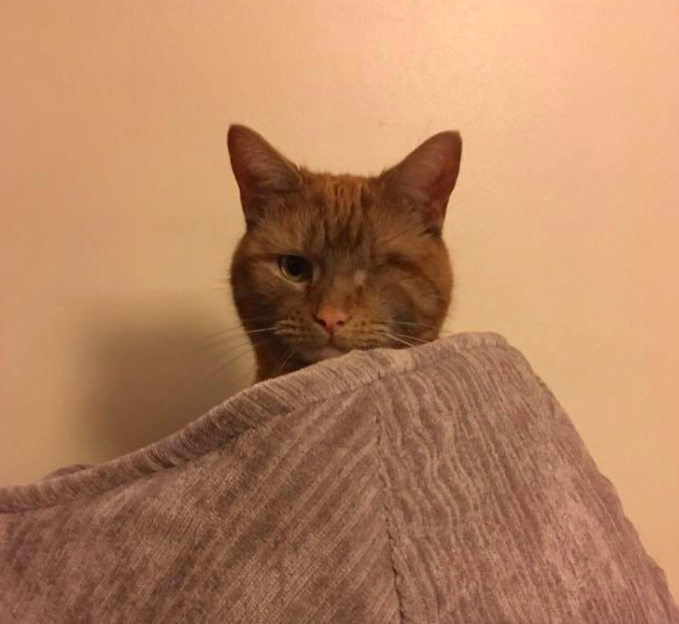 Even with his one eye, he still loves leaping from doors, curling up with my dad, hiding in boxes and trying to attack animals on the television. What’s the best thing about Boris? How does he make you smile? He makes me smile when he licks my face in the mornings and when he waits on the side of the bath to be washed. He has occasionally fallen in! What is Boris’ favourite thing to do? And does he have any mischievous habits? Boris loves having company and he is desperate for affection from any visitors, including my niece and nephew and Dad’s carers. 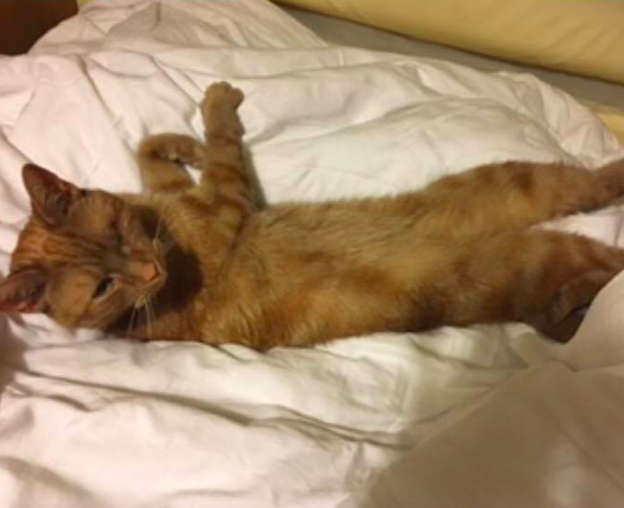 He loves to have his tummy tickled and lie across the middle of the bed so that you can’t turn over. What makes your relationship with him/her so special? My relationship with Boris is all the more special because he was my main source of comfort when my Dad was ill. He has given so much love and affection to my Dad, to the point that during hospital visits, his main reason for wanting to come home was to be with Boris. We are both so incredibly lucky to have our little ray of ginger sunshine in our lives.